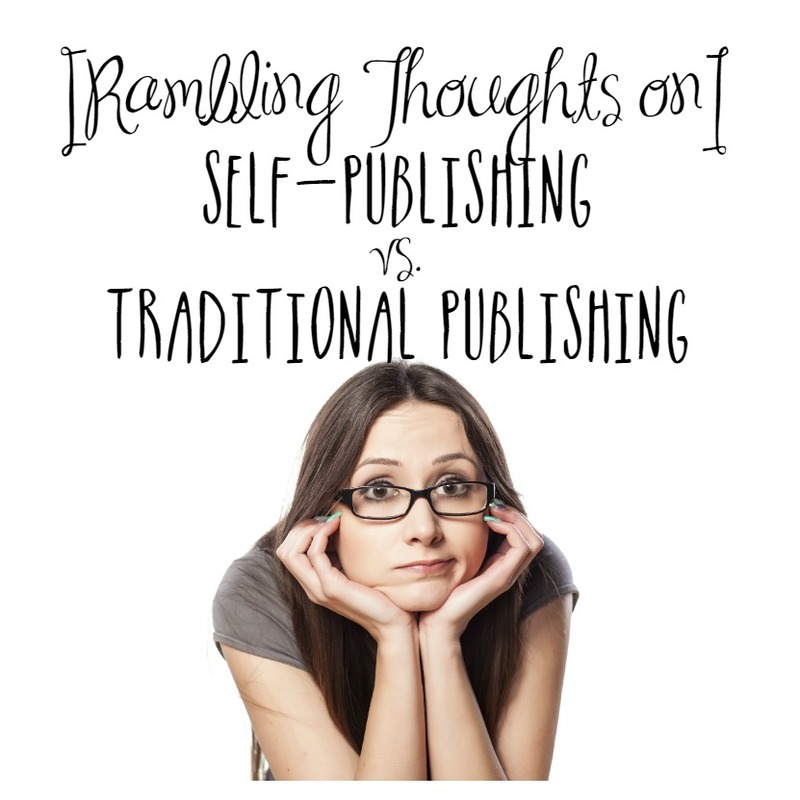 I often see people falling into the camp of “If I Can’t Publish Traditionally, I’ll Self Publish,” and I think that’s a dangerous place to vacation, since there are pros and cons to both sides. In my (amateur) opinion, it’s better to examine both sides thoroughly and choose which avenue suits you best and then go after it. Obviously, in traditional publishing, there’s the benefit of having a publishing house to help edit your book, format it, market it, etc., but then again, your royalties are significantly less than if you self-publish (we’re talking maybe less than 15% for traditional and about 70% for self). In self-publishing, you have total control of everything (your book’s content and cover, your marketing plan, etc. ), and in traditional publishing, you lose a lot of that control. On the flip side, you’re working with experts who can often push your writing past the brink of your own talent and into a whole new level. Sometimes I talk to people who say, “Well, if I can’t get a traditional book deal, then I’ll just self-publish this story, write another book, and hope to publish that one traditionally.” My concern with this is that if your self-pubbed book doesn’t sell well, you’re going to have one more hill to climb to get an agent for the next book. In other words, if an agent sees that your self-published title didn’t sell well, it’s going to be an even bigger gamble for them to take you on. That’s why I say to just stick to your guns. Make an informed decision of what you want and go after it. That might mean abandoning your first story (or second or third) to the bottom drawer while you work on crafting a new story. And that, my friends, is hard. I poured four years of my life– blood, sweat, tears, joy, sorrow– into writing Lights All Around, and for it to not get an agent was tough. But I will tell you right now: it wasn’t ready. It really wasn’t. Oh, how I thought it was! But, now, three years later, I can’t tell you how glad I am that it’s in the bottom drawer and that Truest will be my debut novel. Consider the alternative: what if I had self-published Lights All Around? Well, I know now that I would not have had the resources to promote and market it, so I would have had piddly sales. Then, when I tried to sell Truest, I’d have had to explain my lack of sales. And even if I’d still gotten the book deal for Truest, I’d probably be ashamed that I had this sub-par first novel floating around out there. I repeat: I did not think it was sub-par when I was querying it. It was the best I had to offer at the time. But really, I was just cutting my teeth on writing fiction. I had so much to learn. My gosh, I STILL have so much to learn. Anyway, I know this post is all over the place, but I hope that it sheds some light on things to consider as you determine which route is best for you! Would love to hear your thoughts in the comments below! This entry was posted in creativity, writing and tagged self-publishing versus traditional publishing jackie lea sommers by Jackie Lea Sommers. Bookmark the permalink. I totally agree! So many people email me asking about which is “better.” I don’t think most writers realize there are real pros and cons to both, and it just comes down to what’s right for them. After over two dozen attempts in a five year stretch, the doors remained closed for publishing my spiritual memoir traditionally. I knew I was not up for the challenge of going it alone in self-publishing. So, for a very modest rate I found a team of high quality young para-professionals looking to build their portfolio in editing, formatting, and book cover design. I even found a consultant to help me run an indiegogo campaign. The cost of producing what I believe to be a professional, top-notch book is now covered and, while I don’t expect to be featured on the cover of Fortune, I’m happy to be sharing my story with the world.